District 5 (San Antonio) held its Winter Children’s Blanket Brigade on November 19 to provide a fleece blanket for every child who arrives at the Children’s Shelter of San Antonio. 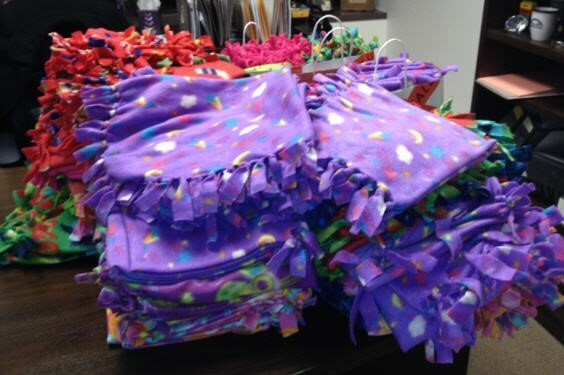 Funds were donated by Weston Properties (San Antonio) to cover the cost of materials, and members (and friends) of the Paralegal Division in District 5 gathered to make the blankets. Many thanks to Patti Giuliano, Barbie Celaya, Allison Seifert, Susan Wilen, Denise Salinas, Michele Patterson, Brenda Key, Dina Foster, Venisa Dark, Terri Grimmett, the NJHS girls from Lopez Middle School (especially Marita and Carrie who pulled double duty! ), Matthew Martinez, Pam Huff, and Barbara Hanson for your help. “Every child has a dream of what he wants to be when he grows up. Unfortunately, not every child gets a fair chance at acquiring that dream.” The Children’s Shelter of San Antonio gives children that chance. They also give them the things that every child deserves: to grow up in a loving environment, eat three meals a day, receive proper health care, wear clean clothes, get an education… and not be abused. District 5 of the Paralegal Division sponsors an ongoing project to provide a fleece blanket for every child who arrives at the shelter. This entry was posted on December 9, 2013 at 10:01 am	and is filed under Uncategorized. You can follow any responses to this entry through the RSS 2.0 feed. Both comments and pings are currently closed.